Panda is a cute, short-haired girl who just wants to live a fun-filled life, but how can she when she is constantly being tormented by evil ninjas? The only one who can possibly help her just happens to be drawing her in his own comic book from his dreams. These two, along with dozens of other colorful characters, all live in a world where nobody ages, but still deals with the everyday struggles of life. This comic is filled with angst-filled love triangles, popularity-hungry girls, a mocha-wired artist, vampire waiters, and battles with imaginary ninjas. 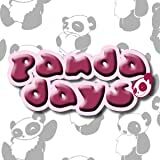 Panda Days is just how it sounds - light-hearted, adorable, cute and loads of fun! Collecting all 5 issues of the original "Panda Days" comic books. With a bonus cover gallery and a few other extras!